Today, I'm reviewing the Ikea Farlov Chair. This post may contain affiliate links. Click here to see my disclosure policy. Maybe it's because it's summer. Or maybe because I'm desperately trying to hang on to the last lazy days of summer before the rush of the new school year. Or maybe it's because living in Houston makes it feel like it's summer 100% of the time, but lately I have really been drawn to all things coastal. This space in the corner of my living room has been empty for a while, and I've been searching for the perfect comfy chair to put there. The kind where you can curl up with a good book and a glass of wine or just a blanket and Pinterest, and feel right at home. So much at home that you don't want to move. For hours. That was the kind of chair I was looking for. Y'all. I fell in love. Like instantly in love. But, for some reason, I still couldn't pull the trigger. You know how when you buy a new car--and you never noticed that kind of car before on the road, but, after you buy the car, suddenly they're everywhere? That started happening to me. All of a sudden, it was everywhere I looked. On Pinterest. In my Instagram feed. In my Instagram stories. In my dreams. I couldn't avoid it any longer. It also helped that my step-son recently became the proud owner of a used pick-up truck. And what are pick-ups for if not hauling long-wished-for items home from Ikea?! Seriously, is there any other use? Furniture *IS* the only reason pick-ups exist, right? We've only had this baby for a few months now, so it's a little early to tell how she'll hold up over time. But, so far, definitely so good. I love that this chair is slipcovered and white, which makes for easy clean-up (hello, bleach!). In fact, not too long ago, I may or may not have spilled some sugar free black cherry jello on the seat before I scotch guarded it. (I STILL haven't scotch guarded it!). Did you know that sugar free jello is pretty much the world's most difficult thing to get out of a fabric? Because it is. But some quick action and some bleach and this bad boy is looking like new again. QUICK TIP: The washing instructions of this chair say do not machine dry the slip covers. I didn't after I spilled the jello--mainly because I was worried about the stain setting in. But, y'all. Trust me when they say don't machine dry this thing! I could barely get that slipcover back on--it is form fitting like a glove. If I had dried this at all, and it shrunk even a smidge, there was no way that cover would have ever gone back on. If white isn't your thing, this chair also comes in beige. The chair is substantial, definitely comfy, and I love how the clean lines give it a modern feel, while the slipcovers give it a coastal farmhouse-y vibe. The texture of the slipcovers is a little rougher than what you'd normally expect from Ikea (not smooth like the Ektorp)--and some have compared it to an outdoor-type fabric. I don't mind the fabric, but if you do, Bemz has already come out with a line of slipcovers that fit this chair. I also splurged on the matching ottoman. I wanted somewhere to put up my feet and really get comfy, y'all. I love that the ottoman opens up, which makes for perfect storage of toys and games and blankets and anything else you want to throw in there. And who doesn't need extra storage in the family room? (Or everywhere, for that matter!) Plus, it has those stay-open-hinge-y things that keep the top open so it doesn't come crashing down on little fingers. Total win if you have littles. Overall, I couldn't be happier with this little Ikea splurge. To see this chair all decked out for Fall, check out this post. Shop this little corner of my living room! Fall is quickly approaching, but before summer slips away from us, I thought I’d share a quick tour of the living room all dolled up for summer. Come take a look! I recently splurged on some new farmhouse style dining chairs for the breakfast nook, and I can’t wait to share them with you! Come take a peek! Want to know more about my latest favorite furniture find?! This Ikea Farlov Chair is the bomb dot com and it's perfect for both modern farmhouse and coastal styles. 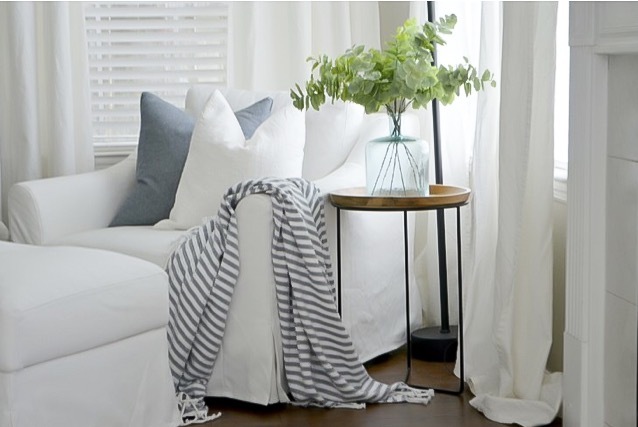 Plus, I'm sharing my #1 need-to-know tip before you wash these slipcovers!